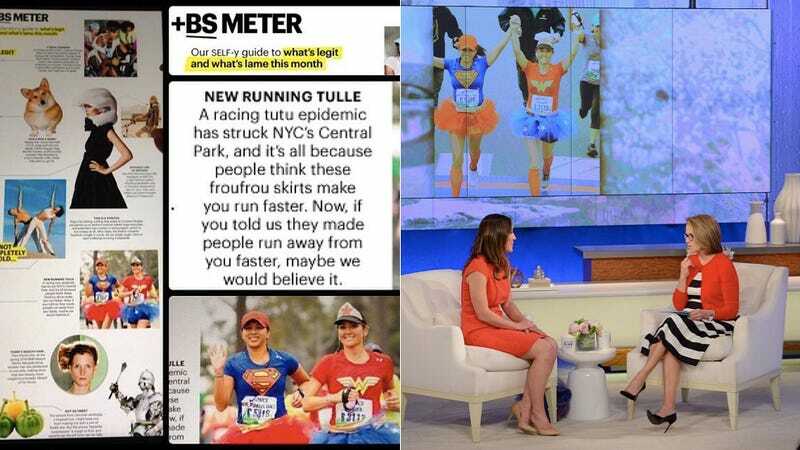 Self magazine is having a rough week dealing with the fall out from their decision to inadvertently make fun of women running a marathon in tutus who were battling cancer. That struggle was made very clear on Katie Tuesday, during an interview with one of the women at the receiving end of their criticism, Monika Allen, who has an inoperable brain tumor. Last week, news broke that Self had repurposed a photo of Allen and her friend/business partner Taramae Baize running in tutus they had made to raise money for the charity Girls on the Run for use in the magazine; Self had implied that running in the outfits was "lame." Shortly after Allen and Baize frustratingly posted about the usage of the photo on Facebook, Self's editor Lucy Danziger apologized, saying she hadn't been aware of the photo and that she was "personally mortified." Since then, the magazine has discontinued the column the photo appeared in, which was called "BS Meter." "BS Meter" was described as their "SELF-y guide to what's legit and what's lame this months" and was similar to Glamour's "Dos and Don'ts" column that covers the faces of people wearing outfits that magazine deems inappropriate with black bars. "BS Meter" didn't last long; it was only introduced last June, when Self redesigned their magazine. At that time, it was called "a monthly matrix of trends on a scale from 'legit' to total bull,'" all part of a "fresh and modern" new look for the publication. We are all moving forward, together. Monika is a complete inspiration. She doesn't let anyone (or anything) define her and is living life every day to its fullest. SELF is passionate about women supporting each other, learning from each other and respecting each other. Here is how you can join in and #ChangeTheConversation. In this interview, Allen revealed, as she did to Katie Couric, that she has an incurable tumor in her brain stem. She's done radiation and chemotherapy, but will never be in remission. She told Couric that she's "just living day to day, hoping that with the research that they're doing right now that they'll come up with some type of cure and that I can live long enough for them to find some type of treatment that will keep me alive." In a statement to Katie, Danziger said the mission of Self is "to empower women to live happy, healthy and active lives." This seems like what Allen thought the magazine was about before she got involved with them; she explained that when whichever (perhaps now demoted or fired) editor at Self emailed her to ask about using the photo, she didn't even think to ask what they were going to use it for, "assuming it would be positive." Allen is happy that end result has been positive though: her tutu organization Glam Runner has raised thousands of dollars following all this attention. By the way, I think this whole snarky, nasty, judgmental thing that magazines and all media tries to do, I mean I think people should stand up and say "Enough of that!" Couric's female empowerment show goes off the air in June.